Oscar Goldman can’t stand still. It’s a fact that anyone who knows him, including his owner, Helen Goldman, will attest to. Oscar with owner Helen Goldman waits to be seen by Liz Hodson. 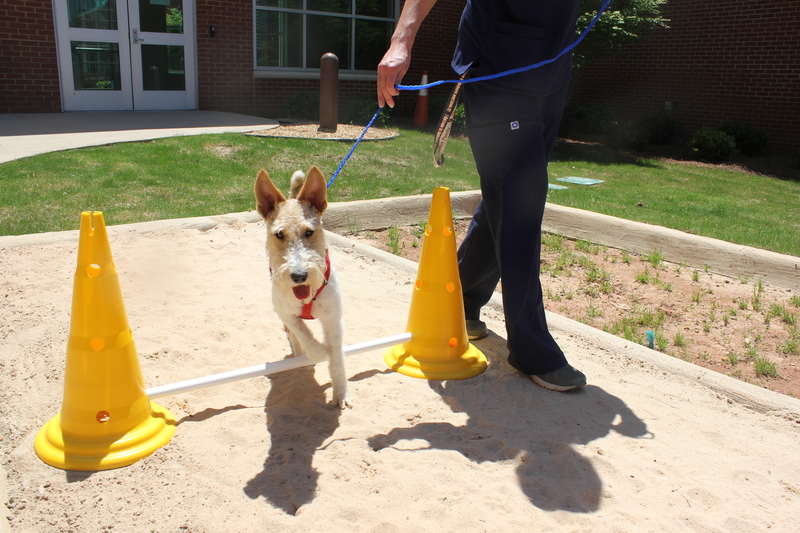 Oscar, a two-year-old Wire Fox Terrier, can usually be seen jumping, running, playing fetch and wrestling with any and all who will spend a few moments with the gleeful terrier. But when Goldman, of Auburn, started seeing Oscar hopping around with one leg tucked up last February, she knew something was wrong. “At first I thought it was his toe that was bothering him,” Goldman said. After consulting with her local veterinarian, Goldman brought Oscar to the Auburn University Veterinary Clinic at the College of Veterinary Medicine. Faculty clinician Dr. Robert Lofton examined Oscar. X-rays quickly revealed that Oscar’s leg had a deformity in his femur. After a quick consultation with other veterinarians, surgery was performed on Oscar to remove a portion of his femur. With the portion of bone removed, Oscar’s leg muscles will expand over time to hold the leg bones in position and allow him to move normally. “Oscar has a great personality, and after we saw that his femur was the source of his pain, we did what was necessary to fix the problem and allow Oscar to keep being the playful, loving dog that he is,” Dr. Lofton said. 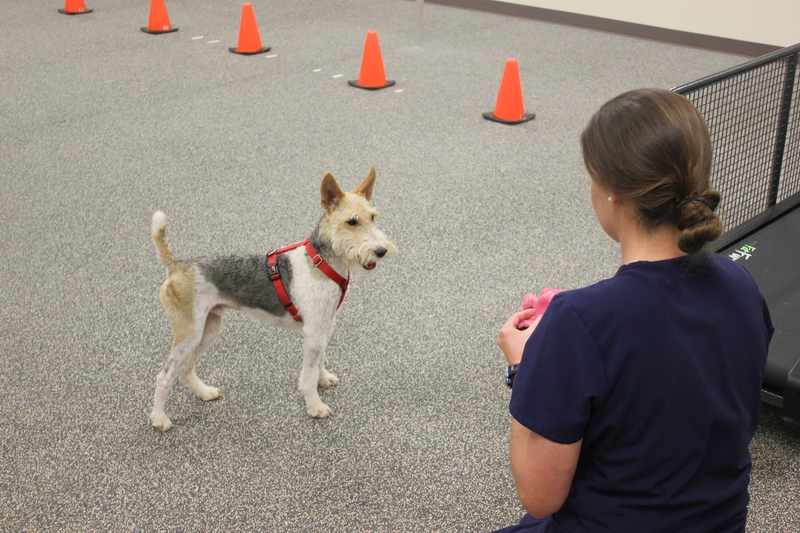 With the surgery complete, Oscar’s next step was physical rehabilitation. His leg muscles had deteriorated due to lack of use, and it was up to Elizabeth “Liz” Hodson, the hospital’s physical rehabilitation technician, to help Oscar regain the use of his leg. A schedule was developed to accommodate Goldman’s work routine, as an employee of the Auburn University Library, which allows her to drop Oscar off three days a week for rehabilitation. His sessions may look like playtime, but are actually an intense workout to properly teach him how to develop his leg for greatest strength and flexibility. Oscar enjoys a game of fetch as a warm up to his therapy. Oscar’s therapy sessions begin with a simple, warm-up game of fetch. Because Oscar is so energetic, Hodson explained he needs to become mildly fatigued so that when he’s doing more developmental activities, he retains his focus. His next steps are in the aquatic treadmill. And while it’s like water play for Oscar, in actuality the treadmill exercise allows Oscar to stretch his stride without having to support his full weight on his leg, maximizing recovery while minimizing further discomfort. Oscar’s next stop is Rehabilitation Park, an outdoor exercise facility recently opened at the teaching hospital with small grassy knolls and adjustable hurdles which provide additional exercise routines for companion animals. 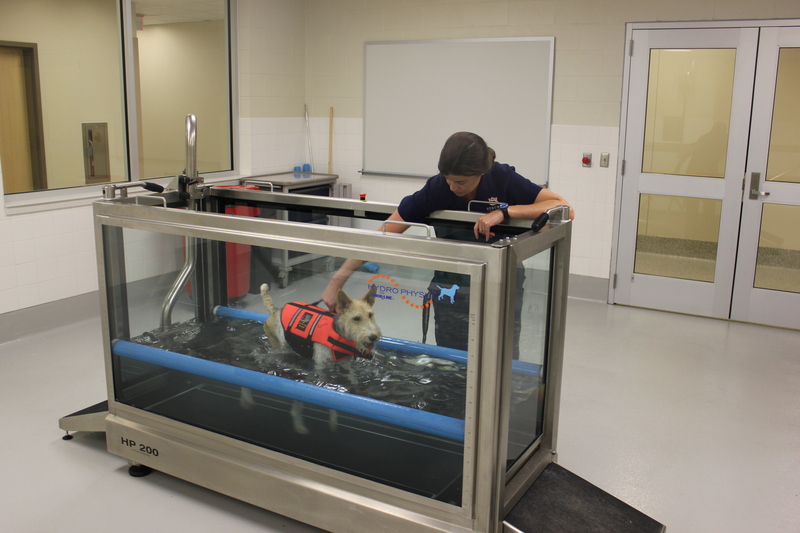 Oscar, guided by Hodson, develops his leg muscles and stamina in the aquatic treadmill. Oscar completes eight to 10 repetitions on the hurdle course, and because he can’t fully support his weight on his leg, Hodson keeps the hurdle poles low. Guided by Hodson, Oscar carefully walks over each pole, using the injured leg just enough that it can develop muscle strength and flexibility. Goldman has nothing but praise for the faculty, staff, and professional DVM students of the teaching hospital that have helped Oscar as he continues to heal. “They’ve been so wonderful,” Goldman said. “They’ve all been so kind to Oscar, and they talked me through the process of surgery and rehabilitation, and made sure I understood everything. Oscar will continue his rehabilitation for about another month, with an expected goal of being fully recovered and returned to the playful, happy dog that has touched the hearts of Goldman, Hodson, Dr. Lofton and the students who have made it their mission to ensure that Oscar makes a full recovery. As anyone will tell you, Oscar just can’t stand still, and they wouldn’t have it any other way. Oscar navigates the hurdle course in Rehabilitation Park.